From the recent announcements, we have Resistance set in the period leading up to TFA. We also have the Jon Favreau live-action series which will be in the era 3 years after the end of RoTJ. Maybe Lucasfilm have got lots of potential Ben Solo content up their sleeves but they seem set on repeating the patterns we’ve seen with Rebels, Rogue One, and now, Solo, in that they’re playing in a limited sandbox because they will have to work around existing canon instead of going into unknown eras. I’m assuming post-RoTJ Luke and child Ben stories will be told in some form but much of this depends on how Episode IX goes and what plans they have going forward. If things don’t end as expected for Kylo, the interest in those stories will plummet as they have from some Luke fans who hated TLJ. Solo is also suffering from this, in my opinion, because we know how Han’s story ended and Solo didn’t really add all that much to it. Lucasfilm should really rethink the timing of some of their storytelling releases and the mystery box approach which means a lot of important plot/character points end up in ancillary materials which a large percentage of fans will never read or be aware of. The ST is also suffering from this with the Phasma novel/comic followed by her subsequent death in TLJ without most people knowing/caring about her history. Things that might make Poe a more interesting and well-rounded character are relegated to the comic series. And there is still a lot of uncertainty about Rey, Kylo and Reylo outside of the fandom because people who only watch the films are missing out on all kinds of information and supporting evidence. @Night Huntress LF can easily work their way around big spoiler content to give us Ben Solo material. It's not like everything this character has ever done in his life is a spoiler for IX. @YeeRees wrote: From the recent announcements, we have Resistance set in the period leading up to TFA. We also have the Jon Favreau live-action series which will be in the era 3 years after the end of RoTJ. Maybe Lucasfilm have got lots of potential Ben Solo content up their sleeves but they seem set on repeating the patterns we’ve seen with Rebels, Rogue One, and now, Solo, in that they’re playing in a limited sandbox because they will have to work around existing canon instead of going into unknown eras. I’m assuming post-RoTJ Luke and child Ben stories will be told in some form but much of this depends on how Episode IX goes and what plans they have going forward. If things don’t end as expected for Kylo, the interest in those stories will plummet as they have from some Luke fans who hated TLJ. Solo is also suffering from this, in my opinion, because we know how Han’s story ended and Solo didn’t really add all that much to it. Lucasfilm should really rethink the timing of some of their storytelling releases and the mystery box approach which means a lot of important plot/character points end up in ancillary materials which a large percentage of fans will never read or be aware of. The ST is also suffering from this with the Phasma novel/comic followed by her subsequent death in TLJ without most people knowing/caring about her history. Things that might make Poe a more interesting and well-rounded character are relegated to the comic series. And there is still a lot of uncertainty about Rey, Kylo and Reylo outside of the fandom because people who only watch the films are missing out on all kinds of information and supporting evidence. @rawpowah wrote: @Night Huntress LF can easily work their way around big spoiler content to give us Ben Solo material. It's not like everything this character has ever done in his life is a spoiler for IX. Maybe not a spoiler for the plot but they want to keep his character- particularly his motivations a mystery. What's going on in Ben Solo's head is basically the whole point of the ST. I know the antis and many fans would disagree and it's just my personal opinion- but the Sequel Trilogy is the story of Ben Solo told mainly from Rey's perspective. I don't say it takes away Rey's agency- she is equally as important...but they don't want to give away anything that could make him more sympathetic. I understand your frustration I share it...I'm grasping for every little crumble LF is giving us. From the few sentences in books or any extended material. But I kind of get why they keep it. There's the Favreau live action show post-RotJ, the Resistance cartoon, the Poe comics, he had a journal/flight log type thing, Rose and Paige both had journals, they had a pre-TLJ Resistance novel when TLJ came out, and there's also a series of kids Join the Resistance books. Not only Rebels, but Clone Wars before that were in a similar vein. Plus the Phasma novel and comics. The sheer volume of Resistance material is actually a little comforting because it's ancillary material, it's meant to be bonus, not to tell integral parts of the saga films (ideally, even though it sometimes does). They do this here so they don't have to do it in the movies. As people have said earlier, they can't do much other ST-related content right now because Kylo and Luke and Snoke are still big mysteries, even if the audience doesn't realize it. Which just makes me even more curious for IX, because that means LF is hiding big things, which could possibly change the way viewers see these characters and the story. I'm interested to see what they have in store for us. 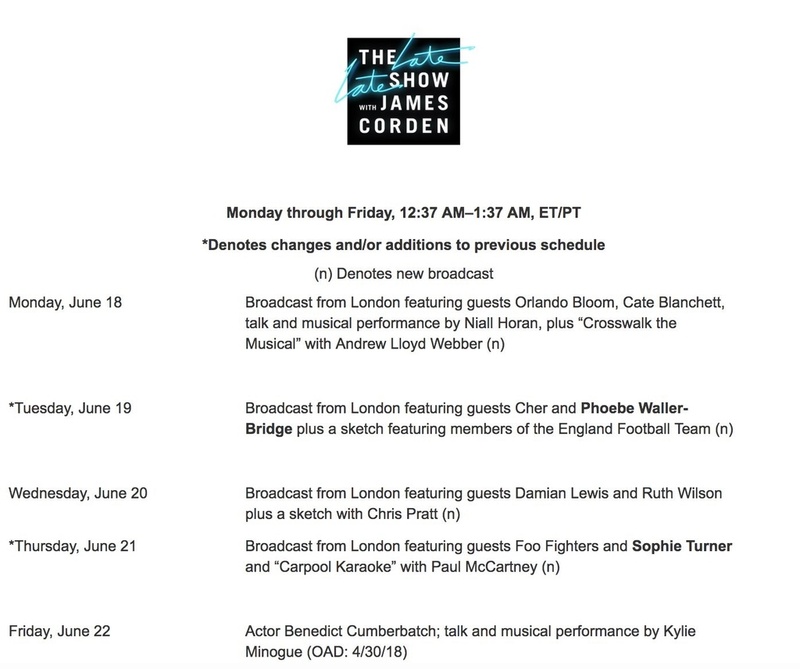 J.J. is scheduled to appear on the Late Late Show with James Corden on Tuesday June 19th. Fingers crossed that he drops some details about IX. @Kylo Rey wrote: J.J. is scheduled to appear on the Late Late Show with James Corden on Tuesday June 19th. Fingers crossed that he drops some details about IX. I am fully prepared for the inevitable onslaught of "Rian Johnson derailed the ST so JJ was forced to do a story he didn't want to do" accusations. Happy b-day, JJ! He's 52 and does not at look it at all. From an EW interview a few days ago. It's mostly about the new Stephen King show on Hulu that just came out JJ worked on, but this was at the very end. You haven’t directed a TV episode since the pilot of Undercovers in 2010. Obviously at the moment you don’t have the time, but have you thought about coming back to the TV space as a director? Very much so. There’s a series we’re doing for HBO called Demimonde that I’m incredibly excited about and was planning on directing, and then [Star Wars] Episode IX happened, so I’m not going to be doing that pilot. It was something I was dying to do, so I’ll produce it and work with whoever the director ends up being. I would love to do television. I miss it. Since you mentioned it, where are you with Episode IX? How does it feel to wrap up a story after being the go-to guy for starting them? When the time is right, I cannot wait to talk to you about Episode IX. [Laughs] At the moment, I can say that it’s an incredibly exciting prospect, and it’ll be fun to talk about. Of course he can't say much right now, there haven't even been formal, official announcements about filming or casting. But every quote I've seen from JJ has him almost chomping at the bit to talk about IX. JJ's HBO show, a kind of sci-fi drama no one knows anything about, got announced earlier this year, along with the fact he was writing the pilot. He's been in 100% producer mode since TFA, and hasn't written or directed anything since. I get the sense this was supposed to be his big comeback. It says something that he was totally on board to do this pilot himself, and many people forget that before all his blockbusters, he was, and still kind of is, the TV guy, but the draw to IX was stronger. Interview is live and there is nothing to discuss here. "We are happy and you will be satisfied too, and I want to overhype this movie blah blah blah"
- J.J., I gotta ask you—you just wrapped Episode IX. That photo made me emotional just looking at it. Can you talk about that moment on set, wrapping that film? It was actually a pretty emotional thing but the cast and crew just did an unbelievable job and I just cannot wait for you to see what we got going for you. - Did the way that you approached Episode IX, was that affected by the way that people reacted to The Last Jedi at all? No, I think that every movie is its own movie and obviously this is a trilogy. We brought to that movie all the passion and hard work that we would have no matter what, so I think the story speaks for itself. I really, truly, can’t wait for you to see it. - Can I just ask you about directing Billy Dee Williams as Lando and what that was like for you? Because I know you’re a big fan, but we get to see him as Lando again. I met him once before and he was such a sweet guy but I gotta tell you, I have such an unbelievable respect for him. We had a great time and he was wonderful. He just had this aura around him. He’s really an incredible man and incredible actor. - Can you give me a word or something we’re going to feel going out of this movie, because we’ve seen two other Star Wars trilogies come to a close. How does this stack up compared to [Revenge of the] Sith and [Return of the] Jedi? You’ll have to determine that yourself, but I really can’t wait for you to see it. And there are a lot of words that we all hope that you feel and obviously the biggest and most important one is satisfied. - Fans are just clamouring for that title. Can you give us any kind of hint on when we’re getting it? No. But it’s really fun talking to you though. I found this part of the interview the most encouraging.
" I had some gut instincts about where the story would have gone. But without getting in the weeds on episode eight, that was a story that Rian wrote and was telling based on seven before we met. So he was taking the thing in another direction. So we also had to respond to Episode VIII. So our movie was not just following what we had started, it was following what we had started and then had been advanced by someone else. So there was that, and, finally, it was resolving nine movies. While there are some threads of larger ideas and some big picture things that had been conceived decades ago and a lot of ideas that Lawrence Kasdan and I had when we were doing Episode VII, the lack of absolute inevitability, the lack of a complete structure for this thing, given the way it was being run was an enormous challenge." Hope. Full circle stories are built on Hope. Of course fandom had to turn JJ's interview into an extension of the eternal Plotgate. I'm not alarmed, only mildly surprised we got an interview before Celebration. Which maybe wasn't the smartest choice, since the lack of information creates more of an existential dread in people than it would if they had something more concrete to latch onto at this point. I'm honestly not going to watch the media news shows I normally do today because the headlines and discussions, even for reasonable people, especially when paired with a twisting of Rian's comments in that interview last week, will be terrible. There's a big difference between knowing what you want to do and knowing how you're going to do it. LF always struck me more as "different roads can lead to the same place." In contrast to the MCU, which has been criticized for having their films be too same-y and/or serving the macro-story to the point of not being it's own film, and not always letting directors execute their vision. JJ mentions following up not just a sequel to his movie, but TLJ as well. That's right folks, he's not going to ignore TLJ and make a direct sequel to his own SW movie (I'm looking at you, Kristian Harloff). Also, "this crazy challenge that could have been a wildly uncomfortable contortion of ideas, and a kind of shoving-in of answers and Band-Aids and bridges and things that would have felt messy"... I don't remember Ron Howard talking like this. I understand the challenge of wrapping up, but being uncomfortable about the ideas? Messy is outside of the films, in the space of fandom, reception, bad marketing, but inside the film story, things are not so bad, imho. I don't understand why he got to use so many words with negative connotations. I think he wasn’t expecting to come back so he didn’t really think about everything he was throwing into the story. Now it’s his problem again. But honestly that’s more for the overall history. I am sure the bits that were planned for decades? Are , reylo, kylo’ Plot and Rey. There's a big difference between knowing what you want to do and knowing how you're going to do it. LF always struck me more as "different roads can lead to the same place." I agree with you. Rian taking things in another direction doesn't mean that the ending wasn't the same, it means he took another road to get there, that was different from what JJ would have done. So we also had to respond to Episode VIII. So our movie was not just following what we had started, it was following what we had started and then had been advanced by someone else. I'll leave another old quote here for funsies. 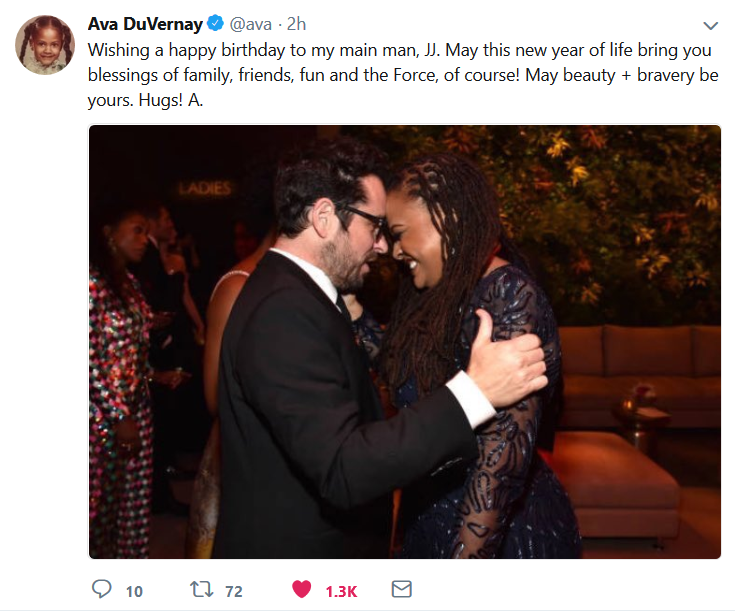 This was shortly before TLJ. Butbutbut...but Rian hated TFA and wanted to throw everything out! @loversinthestorm wrote: I think he wasn’t expecting to come back so he didn’t really think about everything he was throwing into the story. Now it’s his problem again. But honestly that’s more for the overall history. I am sure the bits that were planned for decades? Are , reylo, kylo’ Plot and Rey. Agreed! Honestly, I'm done with wading through all the BS on what followed or didn't, what was planned or wasn't, whether JJ liked or hated Rian's direction. What I do know, based on evidence, is that there are two important elements that seem to have followed a straight and unwavering line all the way through the trilogy, even if they're literally the only two elements that did. Those elements are clearly Kylo's arc and Reylo. As long as those plotlines reach a satisfying conclusion, I'll be content. And I very much believe they will. Kasdan, yeah the guy who Rayne Roberts finally admitted after 2 years came up with the idea of the Force Bond/attraction being forged in the Interrogation Scene, who also wrote Han and Leia's romance, who also got Lord & Miller fired from Solo for throwing out his script and wanting to get the cast to improvise? Uh huh, please tell me again about how JJ is just going to do whatever the f**k he wants and throw out everything Rian (aka the guy who was supposed to fix everything JJ screwed up in the first movie) set up. Also it'll never stop being hilarious to me seeing people bellyaching about JJ like how do you think you would feel if Trevorrow and his "I'm going to film in space" BS was still happening? My tinfoil hat theory in regards to Terrio is that most of what made it onscreen for Argo, he wrote that part and JJ wanted him to handle the Resistance side of the shop along with any scheming/plotting logistics with the First Order. Which is fine because Argo's a pretty good movie and maybe that side of the story will be interesting in a way it hasn't been in the previous two films. Star Wars are multi-million dollar movies, they are not going to just wing it. I remember Rian talking about the budget meetings he and Ram would have with Kathleen and other top brass in the documentary of his making the last jedi. Well, something he had to deal with that no one saw coming was the iconic actress who played Princess Leia— whose movie this was supposed to be— dying at age 60. I’d say that involves band-aids and bridges and contortion and shoving in. We already know that Rey’s hairdo has gone back to Jaaku so that Daisy’s scenes with Carrie could be used, for example. I bet there was a lot of tweaking of the plot involved, not just the visuals, because I’d also bet that Kylo’s reunion with his mother was going to be the outcome and highlight of the film, and that is probably lost— her role will probably be much smaller and quite different and, of course, patched together from what they had filmed for TFA and TLJ. @Lily Snape Yeah that part is heartbreaking and I can imagine part of JJ's reticence in coming back that he alludes to in that interview is that he dealt with Harrison Ford almost getting killed (which also ended up causing him a major back injury) and then Carrie's death when she had one movie left to film. Plus whatever happened with Trevorrow you could always tell from Rian's vague/diplomatic remarks that was a situation unto itself, let alone JJ's comment there about "I'm not the guy" because it probably did not end pleasantly. 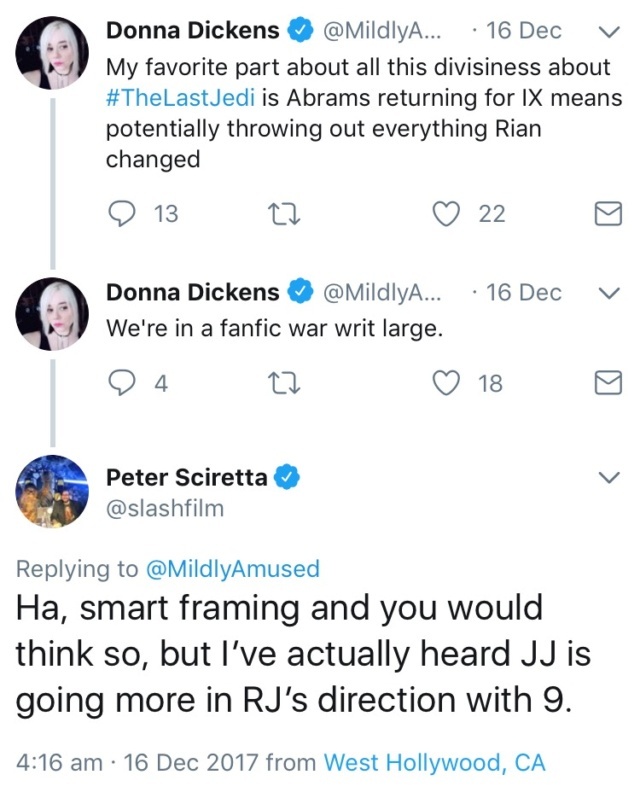 Otherwise, there needs to be a separate "Blame JJ" BINGO card for when IX comes out beside the predictions BINGO card. For everything JJ will get blamed for, you know not making Rey a Skywalker, not killing off Kyle Ron, "Undermining Rey's agency," not bringing back Luke, The Beautiful Friendship Gang/True Trio got shafted, JJ ruined everything Rian set up, et cetera. What the Rian haters have forgotten is that the 'beautiful friendship' gang weren't meant to actually exist as JJ intended to kill off Poe. JJ's decision, nothing to do with Rian. Luke having a dark secret was foreshadowed at the ending of VII.....the expression on his face said volumes. And finally......JJ was the one who described Kylo as a 'conflicted' character. JJ created Reylo. In many ways what Rian did was expand on what JJ had already done. Rian created Rose, created the conflict within the Resistance, but Reylo was , and is, JJ's baby. I always assumed that JJ saw Luke's story (and partly Kylo's backstory) very differently. Also I'm sure that he wanted Resistance and Poe to be more likeable, more like Rebels in OT. I was invested in Rebels while watching OT though I didn't like that much Luke and Han. Leia was the Rebels for me.